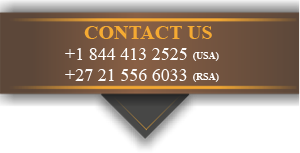 Located in the Madikwe Game Reserve, Jamala Madikwe Royal Safari Lodge is made up of 75 000 hectares of pristine, untouched land and is home to the most superlative number of Wild Dogs in South Africa. The lodge and five luxurious villas portray the true essence of the bygone, African colonial era that includes rich mahogany woods, earth tones of creams, beiges and light greys with a mixture of contrasting silver and brass furnishings. Each villa includes exceptional outdoor amenities such as a luxurious sala and outdoor shower. Breath-taking views of the waterhole, allows couples to experience the African wildlife from the privacy of their own private rim-flow pool. The romance flows indoors with a magnificent antique four-poster bed – draped in whites, an opulent walk-in dressing room and luxurious bathroom overlooking the African bush. 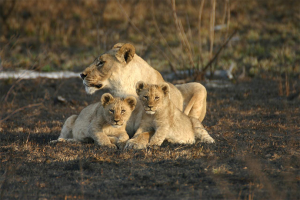 At Madikwe Game Reserve there are an abundance of over 300 different species of birds, Vervet monkeys, Lion, Elephant, Leopard and of course the Painted Wolf – or Wild Dog. The Jamala experience doesn’t fall short with the wildlife, as the lodge also provides guests with an exceptional gastronomic journey. Highly acclaimed chef, Nico Verster will leave guests amazed with his ‘5 star award winning’ cuisine and degustation menu. Guests may dine al ‘fresco, under a blanket of stars, or for a more intimate dining experience may dine in the privacy of their own villa. 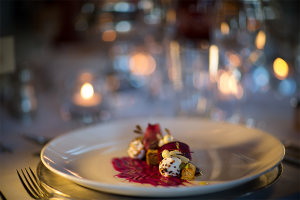 Note gastronomic dinners are an all-round experience and not only limited to Valentine’s Day. 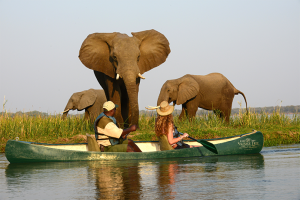 Nestled on the banks of the Zambezi River, Sausage Tree Camp is an idyllic safari experience and is voted BBC Holiday Programme’s number one ‘Ten Best Luxury Destinations’. 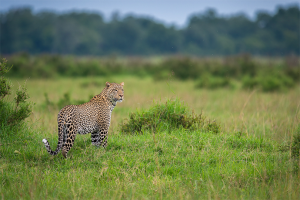 The camp is unfenced and allows the African wildlife to venture freely, giving guests the opportunity to experience animals up close, but at a safe and respectable distance. 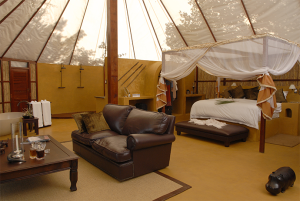 Sausage Tree Camp consists of eight luxurious tents with five being their Signature Tents, two Honeymoon Suites and one Family Suite, or Kigelia House. 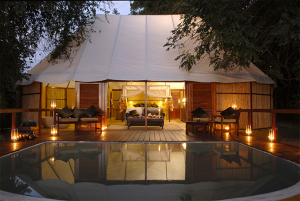 The eight tents are spread out along the Zambezi and encompass a Bedouin –style roof with soft African elements and subtle furnishings. More simplistic, yet sophisticated décor are placed throughout the five Signature Tents and each come with its own four-poster bed, open-air en-suite bathroom and private butler. The two Honeymoon Suites are especially romantic as they have their own expansive wooden deck with private plunge pool. Sausage Tree’s Family Suite or Kigelia Family House includes two lavish en-suite bathrooms, a lounge, dining area, private pool and wooden deck. 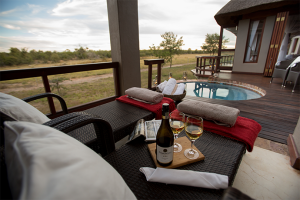 Guests can look out onto the open plains from the privacy of their own rooms, spotting various animals such as Aardvark, African Elephant, Lion, Caracal, Leopard and Buffalo. For those more romantic moments, Sausage Tree Camp offers intimate dining experiences by moonlight, starlight or by candlelight making this camp the ideal ‘Valentine’s Day’ destination. Settled in the Mara Triangle along the edge of the Great Rift Valley, Angama offers guests expansive views over Kenya’s Maasai Mara and is also home to the world’s magnificent, Great Wildebeest Migration. 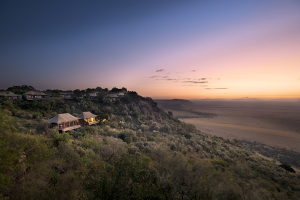 Angama Mara is the idyllic place for romantic getaways as the camp is made up of fifteen intimate suites, each with their own breath-taking views over the Mara below. Each tent was carefully designed by Silvio Rech and Lesley Carstens alongside the King of Canvas who artfully put together the suites outstanding canvas walls and ceilings. The fronts of the tents are lined with floor to ceiling glass inviting guests to look out upon an unimaginable and unforgettable world. Views can also be seen from the bath, shower, bed and sitting area. 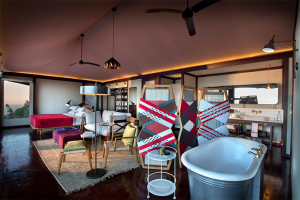 Suites are decorated with soft, romantic tones of creams and olives with woven chairs and pops of Maasai red. To really experience Angama, guests need to treat themselves to a very special picnic on top of the hill where the classic movie, ‘Out of Africa’ was filmed. The picnics are very intimate, romantic and exclusive to couples as it can only comfortably accommodate two. In the early hours of the morning, wake up to a phenomenal scene of hot air balloons floating past the African sunrise. You’ll simply lose yourself at Angama Mara. For a coastal experience, the Birkenhead House is a luxurious 5 star hotel, situated on top of a small cliff and overlooks the majestic oceans of Walker Bay. This is a marine lover’s paradise and is the ideal location for whale-watching, sea kayaking, shark cage diving and is less than an hour’s drive from Cape Town. 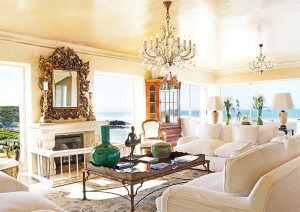 Owner Liz Biden is the creative genius behind the interior of the Birkenhead House. The hotel consists of eleven rooms, none of which are the same but carry a mixture of contemporary design combined with a sophisticated, laid-back style. 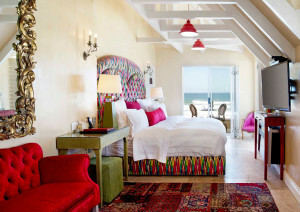 Rooms are decorated with unique artworks, antique-style furnishings and splashes of colour. 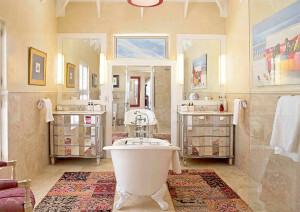 Each room also includes a signature king-size bed and an exquisite Liz Biden designed en-suite bathroom. Birkenhead House is the ultimate experience for couples who enjoy fine cuisine and wines, as the hotel encompasses a small wine cellar which includes some of the best South African wines. Guests have the opportunity to help forage with Birkenhead’s Executive Chef, Ziyaad Browne and taste some of the Cape’s most exquisite dishes. Chef Ziyaad Browne has a predominant Cape Malay influence combined with Asian flavours and will leave guests in awe.